I’ll be brief – mainly because the PEDALpUNK is an extremely simple, but powerful, device. Imagine, if you will, that you are mixing a track. You think to yourself, these drums sound good, but man, this middle section would sound great with some insane distortion on them – if only I could put them through my Metal Zone. Well, with the PEDALpUNK, that weird psychotic dream is now a reality. PEDALpUNK allows you to put your pedals into a loop to effect the tracks in your DAW with no quality loss. It’s essentially a reamp box with specific features for pedals. It’s only got three knobs – Send, Return, and Focus. The Send sets the level of the incoming signal to the pedals, Return is the level back to your recording interface, and Focus is a variable impedance knob that helps when working with non-buffered and/or true bypass pedals. It has 1/4″ send and return jacks for the pedal loop, a combo XLR/1/4″ input, and the option of a 1/4″ or XLR output, as well as phase and ground/lift switches. I use this pedal mainly with a Darkglass Electronics B7K Ultra (review coming soon) to effect my bass tracks after I’ve recorded them to make them fit in the mix better, and for this it is an absolute godsend. The signal coming out of my interface is rarely ideal for what I need, so the PEDALpUNK takes care of all the problems that arise in those situations. PEDALpUNK! allows analog devices, such as guitar effects pedals, to interact with computers without any quality loss and is now available for pre-order ahead of its April 25 release. The audio interface works with all pedals and can play through any system to create a balanced connection for an unbalanced signal. Conversely, it also works as a distortion pedal. PEDALpUNK has been featured by Music Radar, Premier Guitar and Pedal Finder and is currently available for pre-order HERE. The retail price of the unit will be $399 but is now available for $349 during the pre-sale until April 22. PEDALpUNK was designed by producer and entrepreneur Scott Eric Olivier, who will be conducting an interactive seminar at the Musician’s Institute in Hollywood, CA on Friday, April 22. The clinic runs from 1pm to 3pm and will include a demonstration on the myriad uses of PEDALpUNK to students, who are encouraged to bring their own music files to run through the device. The presentation and workshop will be followed by a Q&A session, and you can enter to win a PEDALpUNK as well! Olivier has been engulfed in the world of music, sound design and digital audio technology for two decades, working with Michael Jackson, Gwen Stefani and No Doubt, Van Halen, Christina Aguilera, Chris Cornell and Goo Goo Dolls. 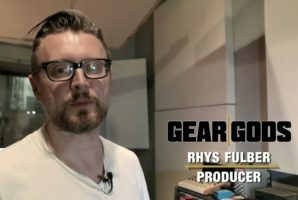 PEDALpUNK is the initial offering from his Casa Distortion bureau and the latest design from the top producer, musical innovator and entrepreneur. Through his companies — including Casa Distortion, Skyscraper Holding Company and the newly formed SSB Technologies –Scott’s also become a technical innovator, both in the music world and outside of it. Ideas just starting now are going to be an integral part of the creative world for years to come. These early tech experiments continue to influence his current projects. Some of them are versed in the music world, including PEDALpUNK! while others, including PrivatePipes, an encrypted extranet data transportation protocol, and enviroNET, a digital, time-based application that allows an unlimited array of computers and electronic devices to operate as one large environment, cast a much wider net.